This riverside city was established when a rumor surfaced that a military road would be crossing over the Snohomish River. The road never materialized. By 1866, the "mother city" of the new county was little more than a clearing in the woods, offering a store and a saloon, and was known up and down the river as Cadyville. 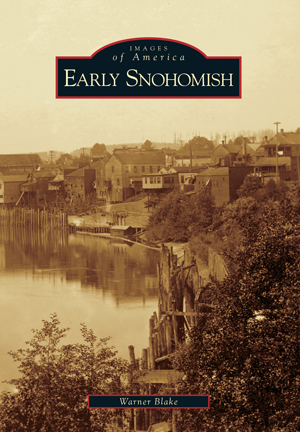 Ten years later, the name Snohomish City was established, along with the first newspaper, the first school, and the first literary society in the county. Farms, logging camps, and trading posts throughout the area pivoted around this growing city and manufacturing center. Even Seattle was not much larger and offered no more amenities. Today 9,000 residents call Snohomish home, and as the area develops farther away from the riverside and its historic roots, this book invites the reader to pause and remember. Local author Warner Blake became an avid student of early Snohomish history while renovating Snohomish County's first Catholic church, built in the 1890s, into an art studio. Drawing primarily on the extensive collection of images held by the Snohomish Historical Society, the author has also included previously unpublished images and memorabilia from the University of Washington Special Collections, the Museum of History and Industry, the Snohomish County Museum, the Northwest Room of the Everett Public Library, and from the first newspapers collected by the Snohomish Branch of Sno-Isle Libraries.